There are always over 120 sculptures displayed among the trees, shrubs and flowers of the sculpture garden (which is in fact more like an ‘open air gallery’). The view over the well-maintained lawn is breathtaking. ‘Rooms’, where sculptures are displayed separately, have been created using yew and boxwood hedges. 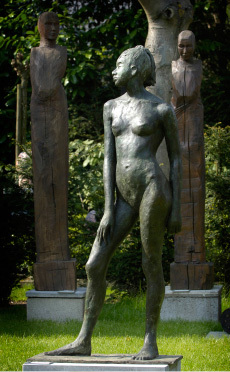 All sculptures displayed in the garden are water and frost-resistant. Of course, there isn’t enough space in our garden for all the sculptures, but if the sculpture of your choosing is displayed separately in an ideal spot in your garden, then there will be enough space to do it justice. We deliver and place sculptures and will also give free advice.